Caleb Bradley now lives in Norway and on the 6th June 2003 emailed me copies of the two tracks that appear on the demo tape, which had been in his possession since 1967. These are Firebrand and Sunshine, and as far as I know the only recordings to feature Nick Pearne. You can hear the first minute or so from the mp3 page. "One morning in late 1967 these yellow cassettes arrived on the desks of the A & R (Artists & Repertoire) managers of UK record companies. Putting the demo tape on a small 8mm film reel seemed a good idea because I had plenty of them and they were easy to post. 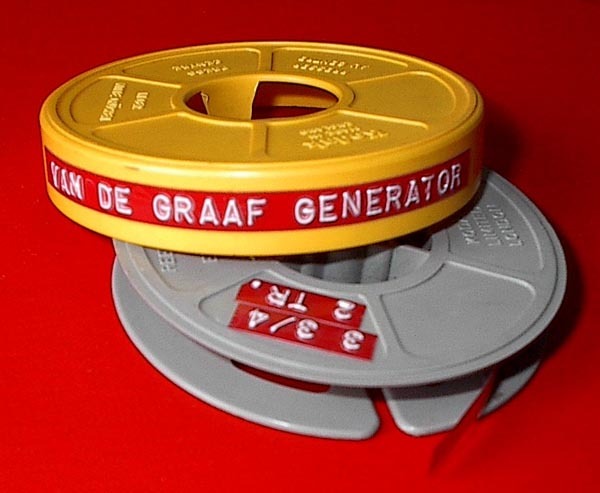 Technically it was not so smart because the hub diameter of the 8mm reel is smaller than many reel-to-reel players expect, leading to the slippage or tape stretch problem heard at the introduction to Firebrand. Today I could fix this by digital reprocessing, but that hadn't been invented then. In those days we believed that no scheme could fail, and my schemes for the VDG were A) to get them under contract at Fontana records and B) get film footage of them playing on a flatbed truck in a triumphal procession through cheering crowds. B) was a very GOOD idea, the cheering crowds of thousands would be available on cue at the Manchester Rag, an annual charity event in the city, and it predated the idea of a promotional video which hadn't really been invented yet." 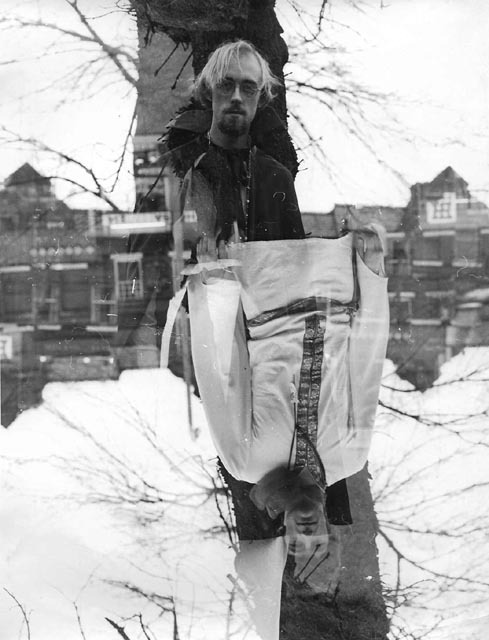 "Although these are leftovers from an outdoor photoshoot in winter 1967-68 that made pictures that later appeared in the Manchester Independent newspaper, a handwritten note reminds us to credit Gordian P. Troeller, the photographer. I was doing darkroom work at that time and was developing and printing 10x8 inch glossies for people, and these survived among my surplus prints." "What I call the "playing card" superimposition might have occurred in Gordian's camera A) deliberately or B) by mistake, or C) I might have done it with two negatives in the enlarger. My memory fails about this." "So, anyway, we made a demo tape (with Nick playing on it). A guy called Caleb Bradley recorded us in Manchester outside in the open air. He was a boffin handyman, an electronics bloke and it was recorded through a combination of television sets that were involved in the amplification process, and we all had to play outdoors for acoustic reasons. I would love to hear that tape again. As far as we know it doesn’t exist which is a shame because it was pretty good. There were only two or three numbers on it but it must have been pretty good because it got us a record contract." "We did contrive to acquire a manager: enter Caleb Bradley, a fellow student. Perhaps we would have been wise to take a deep breath when we saw the sign adorning the door of his bed sit: "Void is All". It was 1968... we didn't. We only wanted to Do Music. Caleb did not get to do much for us, but has an essential part to play in this story. He promised us some recording time. This turned out to be a mono session recorded at his parents' house (while they were away) somewhere on the South Coast. The guitar amp I'd been assured would be there turned out to be a TV set. I had to play in the garden to minimise the buzz. I don't have a copy of the resultant tape, but I'm fairly convinced it would have been unconvincing. 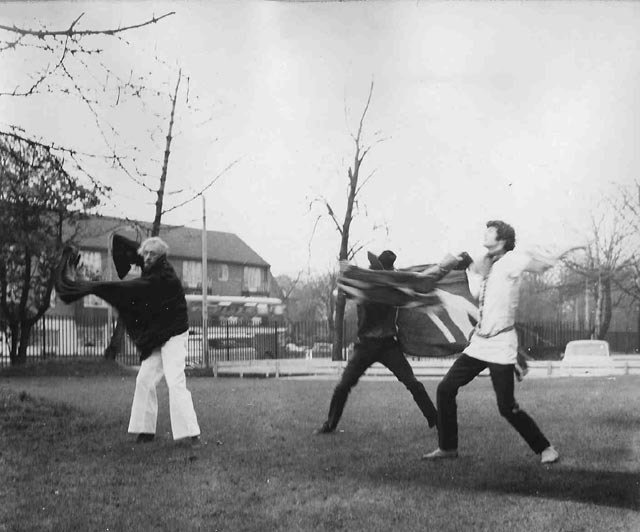 Armed with it, however, Bradley managed to bend the ear of Lou Reizner (RIP), then the representative of Mercury Records in the happening-if-hard-to-understand-from-a-US-perspective UK. A Contract was in the offing." 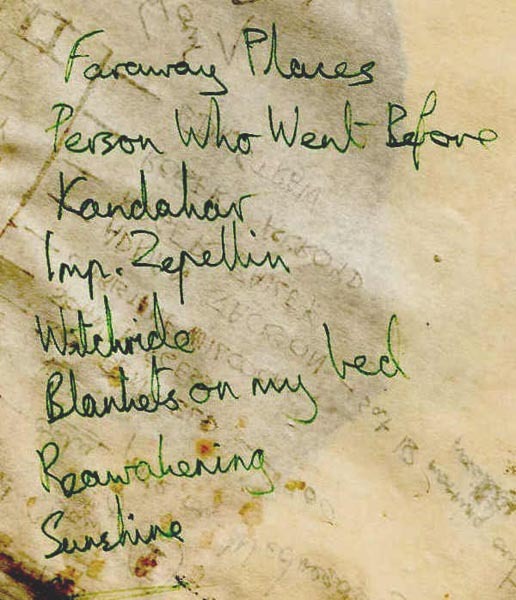 This is a songlist dictated to Caleb Bradley by Peter Hammill in 1967; a list of songs that Van der Graaf Generator Mark 1 were either playing or planned to play. The first setlist maybe! !